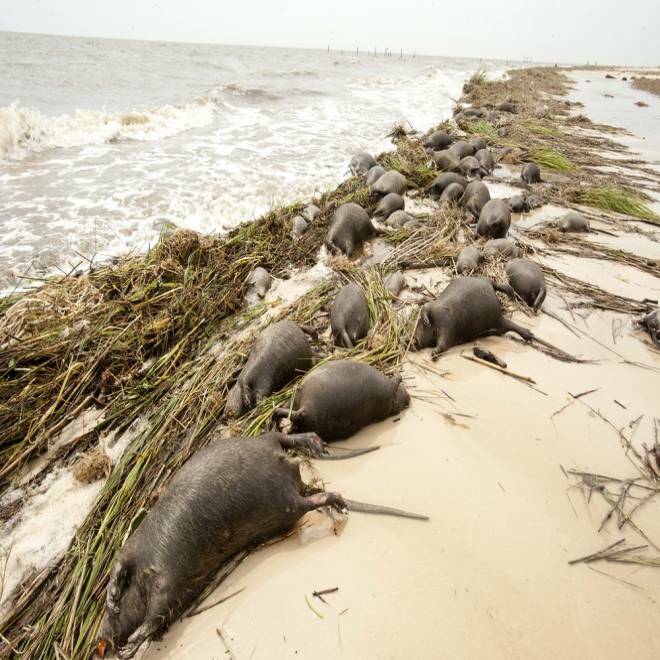 Nutria pile up along the shore on Aug. 31 after Hurricane Isaac went through Waveland, Miss. If there's a silver lining for the Gulf Coast from Hurricane Isaac, it might just be this: the surge of water flushed out, and drowned, thousands of nutria — giant rodents originally from South America that are eating away at coastal marshlands, which act as barriers from storms. Most of the dead nutria have washed up on beaches in Mississippi's Hancock and Harrison counties. "Estimates are there will be over 20,000 carcasses," Robbie Wilbur, spokesman for the state's department of environmental quality, told NBC News. In the short term, that many rotting carcasses is a health hazard. "It's a terrible smell," David Garcia, mayor of Waveland in Hancock county, told WLOX-TV. "As this heat continues, they're just going to blow up and pop, making it even more of a health hazard." Crews over the weekend started removing the nutria, aka swamp rats, though it's not an easy task. "As they're picking them up, they're busting open," Hancock County Supervisor David Yarborough told the Biloxi-Gulfport Sun Herald. A federal contractor with experience in hazardous waste has been brought in, but even a handful of its workers had quit Sunday morning, the Sun Herald reported. "There's people who can't take the sight of something like this," Yarborough said. "That's the reason I wouldn't even attempt this with county people. You really should be certified and trained in hazardous waste." County crews tried to deal with a similar situation after Hurricane Gustav in 2008 "and we had people getting sick; wound up buying everybody's clothes," he added. Classified as rodents even though they are semi-aquatic, nutria were released in Louisiana and Mississippi back in the 1930s by fur trappers looking for new stock. Populations were kept in check as long as fur prices were good, but a collapse in the 1980s led to a collapse in trapping and a population now estimated at several million. As a result, nutria are "one of the Gulf South’s most notorious invasive species, wreaking ecological havoc on native wetland vegetation and contributing to coastal erosion problems," Mississippi's Department of Environmental Quality said in its plan for dealing with invasives. The erosion is done by nutria "digging into thin soils and eating roots of marsh vegetation," the department states. "As the vegetation dies, the fine-grained, denuded soils become more vulnerable to erosion, eventually forming expanding holes in the marsh called 'eat-outs'." The species is also a speedy breeder: nutria reach sexual maturity at just four months old, and females are able to breed within 48 hours of giving birth to a litter. Back along the beaches, the thousands of nutria carcasses are being taken to a nearby landfill, while those in areas away from the public will be left there. "We're letting mother nature take care of those," Chad Lafontaine, with the Mississippi Department of Environmental Quality, told the Sun Herald.